The physical work of digging and the transformative power of hard yakka. When you dig a hole or shovel dirt there comes a point where it becomes about just doing it. It is obvious whether or not you have dug the hole, whether or not you have put your thoughts into action or they have just remained as thoughts. we’re showing the work in melbourne. we will be asking for responses from people that come to watch. if you were at the showing you can leave a comment on this post or on any of the other posts (you may even want to respond to more than 1, go crazy!). if you weren’t at the showing you can leave comments too! we’re interested in hearing about what people saw, about the stories, about the responses and feelings evoked, and any other comments/thoughts as well. also, many thanks to Rae Howell for her beautiful music. catch her and the Sunwrae ensemble live soon in Melbourne. 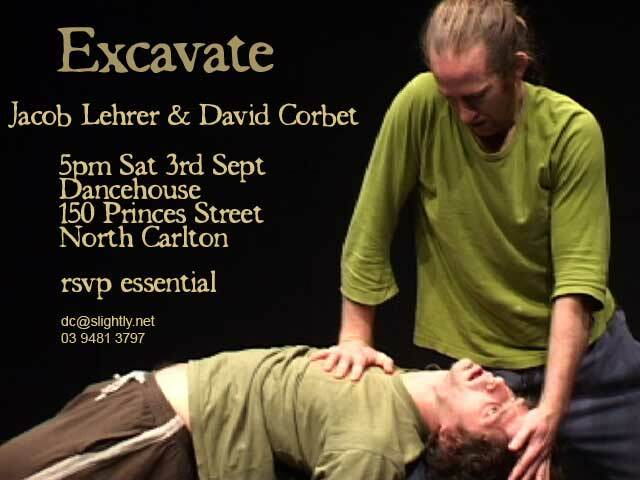 Created and performed by Jacob Lehrer and David Corbet. Presented by the Australian Choreographic Centre. Monday 22 August. Improvisation in dance is always taking a risk, and Excavate effectively captured the essence of confronting relationships and how we, mentally and physically, deal with these emotions. Lehrer and Corbet brought with them fantastically original movement that Canberra will hopefully see more of. Early in the residency we spent some time in the beginning investigations of the relationship between dancer and videographer. This is an area we are interested in exploring further and in more depth. For the moment here are two Quicktime video clips in MPEG-4 format. The first video is some static camera footage we captured of Dianne filming us. This was a performance for camera and we were allowing the dance of the camera to influence our own choreography. Click on the image to load the Quicktime in a new window. During the week Dianne documented much of our work - including the three showings we had on Tues, Weds and Thurs night. This following clip is a short edit of footage from these showings that Dianne put together. We projected this footage in the foyer on the final Monday night performance. Click on the image to load the quicktime in a new window. Before performing tonight we sat and spoke. We spoke about a variety of things and on many levels. 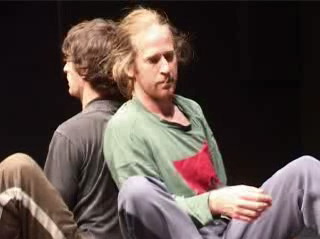 It gave us a chance to settle from the technical set up and entangle our thoughts in preparation to perform. We are using the word entwinement or entanglement to describe this preparation process. It is another piece of the puzzle to unravelling this slippery beast we have decided to learn to ride together. The slippery beast being real-time choreography. Through the rigorous action of ‘not knowing’ and ‘ not doing’ we begin to see and experience the simplicity within complex structures. Being a working pair, our work revolves around the universality of relationship, be it physical, personal or other. We came to Canberra not knowing what the outcome would be. It has been a time for us to examine and excavate the past nine years of dancing. It has been a time to begin an understanding of how our work is seen. In our performance work we spend a lot of time exercising various performative ‘muscles’ - some of these are performance states (such as body state, time/space, emotion, narrative) and some are physiological training (primarily our practise in Contact Improvisation but also other associated body forms and training). When making improvised performance we develop both material (content) and structure (form) in the moment and over the duration of the work. At times, by engaging in not knowing, we allow possibilities and potential within the performance to emerge and evolve. Well, because it seems to allow things to fall into place. click on an image for a bigger version that will open in a new window. The following text was compiled and edited together from three novels. Written on the body by Jeanette Winterson. The Tree of Man by Patrick White. Cloudstreet by Tim Winton. One day, one clear, clean, sweet day in a good world in the midst of our living. And even now, one of the here is leaving. But that is the irony of honesty. and for a few seconds he’ll truly be a man. You can’t help but worry. When we were planning the residency, Jacob asked us each to bring a favourite novel. Last night we read a short section from our chosen novel to each other. There seemed to be a number of corresponding thoughts and resonances with what we’d unearthed so far in our practise in the studio. This morning we sat down to compile some of the text and then begin a process of editing it. Part of our discussion last night, after the day of work, centred around the various aspects of relationship that are exhibited through two performing bodies. Two male bodies. Two physically similar male bodies. Brothers. Mates. Lovers. Father and Son. The same person - two sides of one man. Aggressors. Carers. A reflection of self. The other. A single creature. All of these and more and less being present. Being allowed.